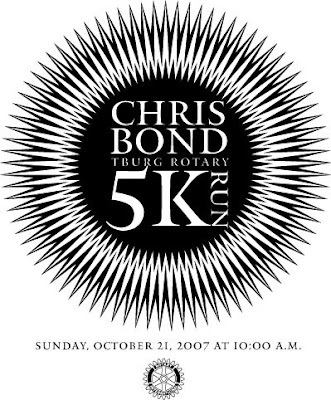 The community turned out in force for the Chris Bond 5K this morning. It was a perfect day for running. Low humidity. No clouds. Brilliant trees. Very convivial and fun. A. and his friend Phil ran...and they seemed to be in the groove. This is an event I hope isn't the end, but the beginning of a string of positive Tburg fun fund raisers. Again, here we are at ten minutes before the last day of Art Trail. More banana bread in the oven (all the bananas that were on the edge are gone...yeah!). Hopefully we will get a nice crowd today. Yesterday felt slower than the first weekend, but no time to sit down the entire day...so not that slow. I need to focus on chickens, water fowl, and domestic geese and ducks. Maybe even take them on as personal assignments to get the wheels moving. A body of work on chickens could be good. However, the Syracuse Seminar (a one hour chat with seniors in illustration, graphic design and advertising design) awaits. I have been marinating in this to figure out the top 3 things I want to say...and I am still scrambled. Need to get R. to help me sort it out. I want to write the entire thing and then fill in the pics etc. versus where I was going which was to get a zillion images together and then figure out what to say. A bit backwards--wouldn't you say?